Jenga is fun for children and also played by teenagers and adults. Their is a long history for this game set around the world and it is played by many cultures in many different countries and always regarded as a lot of great fun while playing. In many countries and for many generations it has been a standard feature in so many homes. The set involves 54 pieces of solid weighted wood blocks in a narrow elongated shape, all equal in size. They are put up into a tower shape and the tower is reasonably stable. You can play it alone, with a friend or even a group of friends and age does not matter, within reason. The games requires a lot of thoughtful strategy because a player can be very selective, he/she needs to gently pull out blocks to start destabilizing the structure, when enough blocks are pulled out a player must be very careful because it becomes very difficult ti slide out a block without the structure falling down. The law of gravity is consistent and working to topple the tower, it’s just a matter of time before it eventually crashes over. Novice players are quick to fail, when the structure falls they lose the game. Experienced players learn through practice where the weaknesses in the structure will be and where it’s safe to pull out blocks. Playing against an experienced player can be very difficult but personally rewarding if the better player makes a mistake and loses it should be noted that experienced players seem to choose to remove blocks very low down on the stack. The game requires precise hand dexterity, there is no room for clumsy moves, one wrong move and the game is finished. Gravity, weight distribution and an eye for details plus balance are all needed in this game and these are good characteristic skills for children to develop. For children to develop such skills while having lots of really good fun makes this a very good toy for children of all ages above three. No child will reject this as a gift, it really is a lot of fun. Being wood, this environmentally friendly gift promises many years of fun and will be a really long term addition to any child’s collection of fun toys. The selection of blocks are all shaped from hard wood and wear plus tear is a minimal probability because the game does not involve robust use and even when the tower falls it has such minor wear implications for hardwood. Wood is free of any hazardous chemicals or toxins so these are very safe for regular handling. The blocks are not treated with any chemicals and are not painted which brings this product fully into being environmentally good, wood is safe and very easy to recycle, though the wood is ultimately sourced from tress the benefits outweigh the implications of negative environmental impact if the blocks were made from plastics. The material choice of using solid dense wood is a good choice and the only way these blocks could sustain some form of damage is if they were left to soak up water or stored in a very damp location. The choice of wood for blocks for this game has a long history and looks likely to continue because wood is the perfect material for this type of game. Children in playing mode will test any toy no matter how strongly it has been built, if a way exists for a toy to wear out and/or need maintenance, children will test the toy to its very limit. Each block is fashioned to be exactly the same size, they are built very easily and quickly into a tower and then systematically and carefully pulled out of the block until gravity and unequal balance bring down the structure, this does not damage or wear out these hardwood blocks and they do not need any form of maintenance. Durability is tops, these are blocks for this game are made to last for years, in fact it is not unusual for children to pass through teenager years into adult age and still have this set of blocks stored away somewhere in the home and/or still play the game. When we look at hard wood we see that the level of durability is exceptionally high, hardwood is even used in the construction of homes because it does not wear out easily, it can and does retain durability in terms of a large number of years. The only impact on the longevity of this product could be if the owner loses a few pieces, feedback from users suggest this can happen but only means playing the game with one less layer of blocks. To make the game not playable it would need to be that a lot of the blocks get misplaced or lost. It is fair to say that durability is at 100% so long as the blocks are not stored long term in a very damp environment in which mold can take a hold and grow on the wood block to damage it. Creativity stems from how often a child plays the game and learns the principles of balanced distributed weight and the power of gravitational pool. 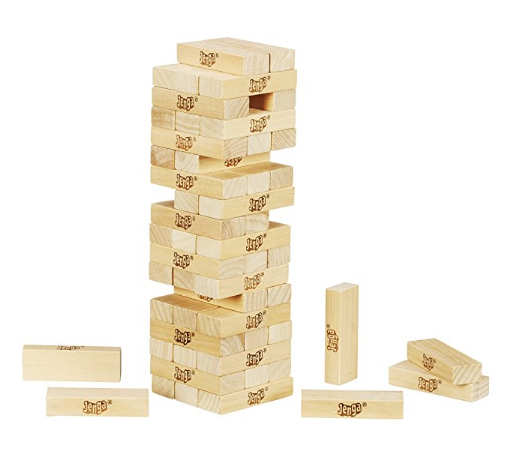 Children will become creative as they figure out through trail and error where to target the stack, remove blocks and put another player at a disadvantage. Creative strategic forward planning is certainly a skill which will develop for a child if she/he plays this game on a regular basis. Children can play this game alone while developing the creativity and ability for planning a strategy to win. Working in a pair or in a team against others will require team work and creativity and this option for playing this game offers a lot of opportunity. Creating a plan which right at the start of the game requires creating a game plan to defeat an opponent is a particularly good method for children to naturally pick up the joint skills of planning, creativity and perception. The concept of the game may at face value appear fairly easy but it does require a lot of strategic creative thinking. Safety is not something which will prove to be an issue, unless we factor in how safely a player can slide out a block of hard wood from a stack of blocks without toppling the entire stack. Wood is a natural material and so there are not any obvious safety hazards for children, teens or adults. The only potential risk is that young children under three years old may be tempted to bite or chew on the wood blocks and though the blocks are a good size they might in such situations present a potential choke risk. Designed to be built into a secure stable stack or tower of wood blocks, the crafted wood blocks are all identical in size and this is purpose of design. The simplicity of how the game is meant to be played appears easy but the designers know that as the game progresses it get more difficult each time a wood block is slipped or pulled out of the stack. The designers of this product have chosen to follow a design which is generations old and historical for this type of game. The makers have not looked at adding new design features because this would probable detract from the play-ability of this popular game. This product stays with all the original design concepts and features. The only real possible change in design would be which type of wood to use. The numbers of wooden blocks cannot be increased as a design feature but they can be decreased in the event that some blocks are lost. Not at all as easy as people may think, this game is very entertaining and highly competitive, yes it is easy to set up the tower of blocks but as the game progresses it is incredibly difficult to keep the tower standing. The weight distribution of the blocks is constantly shifting each time a player removes a block. Gravity is also working against the players. It is a very easy game to set up, the rules for playing are easy to follow,. How well a player can play all depends on lots of practice, a steady hand, a good eye and an understanding for how to remove a block to make it difficult for the next player to do the same. The outcome will always be the same, the tower will fall, it is only a question of when and who causes it to fall down. This game is seriously good fun, very enjoyable and the more it is practiced the better the player will become, the fun part of this game is that the concept for ease of use is actually the challenge designed into the game strategy. Very easy for portability, stow the pieces back into the box and this game can be taken to school, to a friends house, on vacation with the family. It is made from durable wood and the combined weight of the blocks is easy to carry in the hands or in a school bag. Because this product is so easy for portability it can be taken anywhere but this does mean that attention and care needs to be given for not losing any of the wooden blocks. Defining versatility for how the product or toy is used means looking at what the game is used for. The procedure or rules for the game are very easy to follow and there is not any versatility for changing how this game is played. It is a versatile game in that it is player friendly, experienced and new players can take up playing and they will enjoy the fun, it is versatile in that the game can be played alone, in group or even teams. Further versatility is evident when we consider that this game can be played in any location where there is a flat surface. Zero versatility for changing how the game is played. The advised age range is three years and up to any age, no limits on upper age. Very young children under 3 would struggle with the game because dexterity, a steady hand, a good eye for how balanced a structure looks are all skills which are in their infancy in kids under three years. However, with sensible hands on adult supervision by responsible adults it could be that younger children can try playing this game and it is evident that this would help them develop particular skills, though we have to ask ourselves if such young children would have enough focus. The game offers huge fun potential along with suspense, laughter, anticipation and a chance to become very skillful. This is one of those rare toys with a huge entertainment factor and a nice low price tag. Fifty blocks stacked into a tower may seem like a lot but when it is done the tower is very dense and stable. 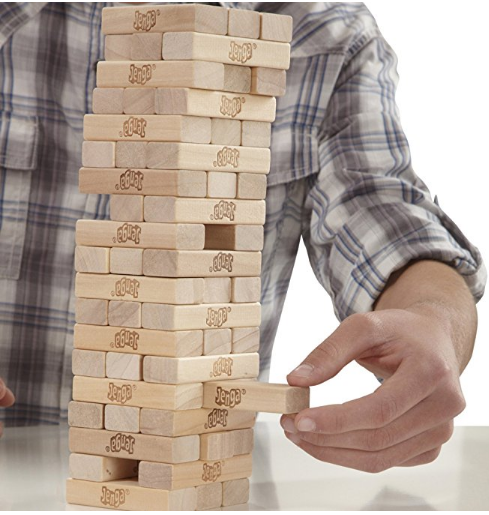 Children taking turns to carefully pull out a block will constantly alter the stability of the tower, deep into the game the tower will actually sway around but can remain standing. It is going to collapse at some point during the game and the person who sets it off to collapse will be classed as the loser. It is certain that regular playing by children will improve hand steadiness and hand control, children will develop a good eye for weakness of balance in the tower and from where to safely and very carefully pull out a wooden block without collapsing it. This game is fun, it can be played anyplace, all that is needed is a stable flat surface, the game can be set up in less than a minute but the fun element of the game can tempt players to spend hours playing. For ease of use, setting up the game is simplicity but playing it requires a lot of skill, planning and thoughtful strategy. The durability level for this toy is outstanding and maintenance needs are none existent due to the use of environmentally friendly hard-wood. This game is a winner for children and can bring a family together to share fun because children who play a lot will become very good and then they are sure to want to play against Mom or Dad. A very good gift at a very balanced price, especially when considering the durability of the product and the level of fun that can be had from this toy for many years.